Conservatives finally admit they’re judicial activists. Washington—Here's when you know something momentous has happened to our struggle over the Supreme Court's role: When Republicans largely give up talking about "judicial activism," when liberals speak of the importance of democracy and deference to elected officials, and when judges are no longer seen as baseball umpires. All these things transpired during Elena Kagan's confirmation hearings before the Senate Judiciary Committee last week, though you might not know that unless you saw some of the most thoughtful blogs or news stories. And what happened has the potential to transform a listless debate that has been ensnared in conservative categories for at least three decades. 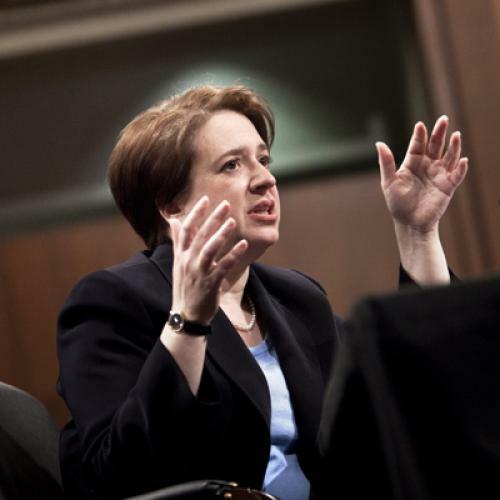 The standard account of Kagan's testimony is that she was brilliant, charming and evasive. The brilliant and charming part is right, as even her Republican critics on the committee were gracious enough to concede. And it's true that Kagan didn't fall into the trap of declaring how she would rule on this case or that. She wants to get confirmed, after all. But far more than she was given credit for, Kagan did lay out a clear judicial philosophy that (1) sees courts as having an obligation to defer to the choices of elected officials except in the most extreme cases, and (2) puts the lie to Chief Justice John Roberts' notion that judges are mere "umpires," as if their task was, in Kagan's cutting word, to be "robotic." And it was Republican senators who seemed to be begging her to be a judicial activist and overturn the enactments of Congress. Thus did Sen. Tom Coburn ask her if she would rule against a law requiring Americans to eat a certain number of fruits and vegetables. "Sounds like a dumb law," Kagan replied, and then she spoke admiringly of Justice Oliver Wendell Holmes who "hated a lot of the legislation that was being enacted" in the early years of the 20th century "but insisted that if the people wanted it, it was their right to go hang themselves." "Judges," Kagan declared, "should realize that they're not the most important people in our democratic system of government." It's a line that might usefully be engraved on a wall of the U.S. Supreme Court building. Yes, Republicans seemed to be admitting implicitly, it is the conservatives who are now the judicial activists. That's why they moved on during these hearings to a new attack line against liberal jurists as being "results-oriented." This phrase doesn't work any better for conservatives. As law professor Jonathan Turley pointed out on MSNBC, it's hard to think of a more "results-oriented" case than Bush v. Gore, which saw a conservative majority declaring that its reasoning in making George W. Bush president was not to be invoked in future cases. Nonetheless, the concession that conservatives are being forced to make on the issue of activism is enormous. On the matter of judges as umpires, Kagan could have ducked and let the pitch sail past her. She didn't. The umpire metaphor, she said, has "its limits" because it wrongly suggests that judging "is a kind of robotic enterprise" and that "everything is clear-cut." Sounding rather like retired Justice David Souter in his recent Harvard commencement address, Kagan said, correctly, that in the hard cases, "there are frequently clashes of constitutional values." That's why "not every case is decided 9-0." Indeed, the umpire metaphor is dangerously and maybe even intentionally misleading. It implies that the answer a particular Supreme Court majority comes up with is the one and only possible answer to a difficult question. If this were true, we would not be having the very political struggle over the court that was so evident during these hearings. And this was the other important milestone of this confirmation battle that bodes well for the future. While Republican senators dominated Justice Sonia Sotomayor's hearings, Democrats this time displayed a degree of discipline you just don't expect from a party that so often sees discipline as a dread disease. One Democrat after another reinforced the argument that a conservative court could bring us back to the Gilded Age by ceding power to corporations and undercutting government's ability to act as a countervailing power on behalf of individuals with weak bargaining positions. Having once made it easy for their opponents to cast them as elitists, progressives are behaving like small-d democrats again. Now that's a change we can believe in -- and an approach that might even win.